Birds nest in the spring, I nest in the winter. The art fair circuit is done for the year, and it is time to rest and reflect. The days here are very short, it gets dark around four in the afternoon. Since there is nothing that has to be done outside there is time to nurture ideas that have been waiting their turn. It is also a good time to look back over what ideas I did make come into to reality and decide if they worked, or if they could be expanded. Several years ago I decided that I would also use this time to experiment with new materials and it has turned out to be a good decision. Even if I don't pursue any of them to a great degree, I always learn something or am inspired in some way. This winter's experiment is with ceramics. I have no interest in making my own coffee mugs or dinnerware at this point, but I have been searching the world over for earthy buttons, beads and pendants to work into my scarves and accessories. I am having some success (pictures coming soon I hope-ceramics can take as long as eco printing) and have had many insights into my fiber work; not to mention meeting an inspiring group of artists. 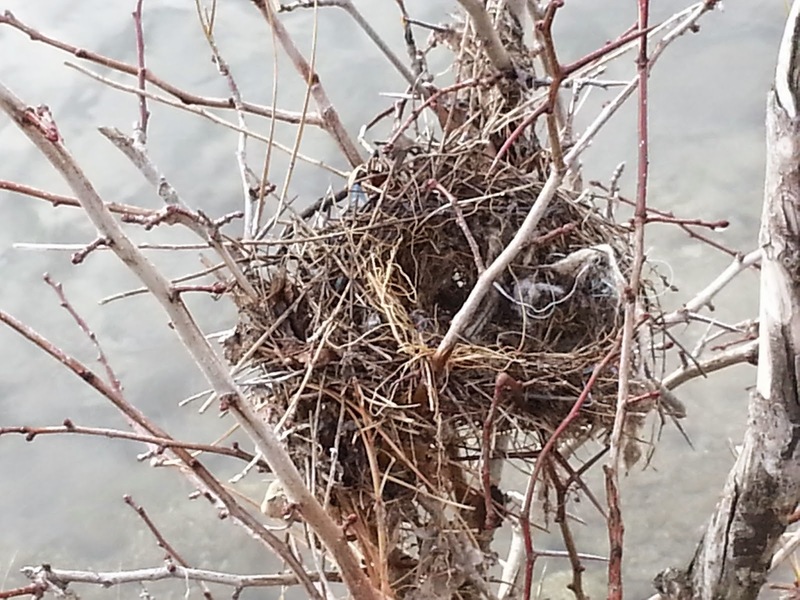 On this morning's walk I found this little nest resting in a branch over the Spokane River. It does remind me that I should also probably think about cleaning and reorganizing my own little nest. After a year of eco printing, my studio does resemble a pile of sticks!